Taking hot water for granted is fine until the system breaks down: suddenly the bath water runs icy cold with nothing to heat it. Make sure you have a constant and reliable supply of hot water all year round by installing a high quality tank with Calgary’s leading plumbing pros. Because you’ll have to live with your hot water tank for many years to come, it’s important to take time out to really consider the best options available. As Calgary’s largest purchaser of hot water tanks, we can provide exceptional value on your new tank; and our well-established plumbing expertise gets it installed and ready to use quickly, efficiently, and reliably. Tankless water systems take up less space, waste less energy and may even provide hot water faster than conventional systems. Domestic hot water upgrades to ENERGY STAR® tankless systems present a tremendous energy-saving opportunity over older, storage tank systems, especially those equipped with standing pilot lights. Rebates of up to $1,000 are available. Contact Pete the Plumber today at 4033 257-1766 to learn more about the program. This helps you decide the most suitable hot water tank system for your purposes. What is the average life of a hot water tank? Hot water tanks usually last about 10-12 years on average. What brand and styles of hot water tanks do you install? 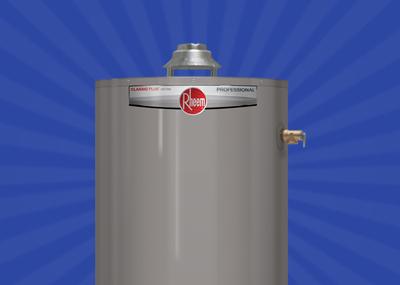 We install Rheem as a preferred brand, but will in special cases, install some other brands. We also install atmospheric type, power vented type, power direct vent type, electric, commercial, and tankless.